The researchers compared directions in the sky where they found superclusters (red circles) and supervoids (blue circles) with the strength of the Cosmic Microwave Background. Superclusters are more likely to coincide with directions where microwaves are unusually strong (red or orange coloring) and supervoids with directions where the microwaves are unusually weak (blue coloring). Scientists have found more intriguing evidence for darkenergy ? one of nature's most befuddling phenomena. Dark energy is thought to make up about 74 percent of theuniverse, while dark matter ? a mysterious form of matter that scientists canonly detect by noting its gravitational pull on things ? makes up about 22 percent.That leaves only 4 percent of the universe composed of things we can see andtouch: the normal protons, electrons and neutrons called baryonic matter. Scientists don?t know what darkenergy is, but they observe its tugging effect, which causes the expansionof the universe to accelerate. Now they have seen this mysterious force in someof the largest known features of the cosmos, called superclusters andsupervoids. The former are particularly crowded areas of space, each witha lot of galaxies huddled in a region half a billion light-years across, whilethe latter are the opposite, rather barren expanses notably lacking galaxies. Astronomers led by Istv?n Szapudi of the University ofHawaii Institute for Astronomy observed dark energy stretching out these areasby detecting changes in rays of microwave light before and after they passedthrough the regions.
? "When a microwave enters a supercluster,it gains some gravitational energy, and therefore vibrates slightlyfaster," Szapudi said. "Later, as it leaves the supercluster, itshould lose exactly the same amount of energy. But if dark energy causes theuniverse to stretchout at a faster rate, the supercluster flattens out in the half-billionyears it takes the microwave to cross it. Thus, the wave gets to keep some ofthe energy it gained as it entered the supercluster." 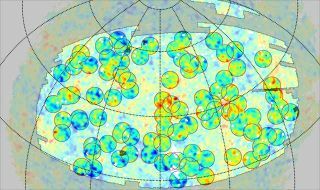 Szapudi, with University of Hawaii postdoctoral researcherMark Neyrinck and graduate student Benjamin Granett, analyzed a map of thevarying strength of the microwave radiation left over from the Big Bang, calledthe cosmic microwave background radiation (CMB), across the universe. Theymatched this data to a map of the universe with the 50 largest supervoids andthe 50 largest superclusters plotted, based on information from the SloanDigital Sky Survey, a project that mapped the distribution of galaxies over aquarter of the sky. As the researchers predicted, the microwaves were a bitstronger if they had passed through a supercluster, and a bit weaker if they hadpassed through a supervoid. ?With this method, for the first time we can actually seewhat supervoids and superclusters do to microwaves passing through them,?Granett said. The team will detail their findings in the AstrophysicalJournal Letters in August or September.